Leader of Sutton Council Ruth Dombey has praised the many hundreds of residents who made sure our local Diamond Jubilee parties all went with bang last weekend. Ruth said: “I was proud to see our borough looking so fabulous over the weekend. It was great to see red, white and blue bunting decorating the streets from Rose Hill to Clock House and Worcester Park to Beddington and all points in between. In all, the borough of Sutton played host to well over 100 street parties and hundreds of back garden barbecues and neighbourhood get-togethers. Carshalton Mums were also delighted to see our local area hit by Yarnbombers ahead of the jubilee celebrations. “I love the ducks, they look fantastic and my son William loves them too!” said Carshalton Mum Caroline Brown. “The knitted ducks are great, well done Yarnbombers!” agreed Carshalton Mum Rachel Castrogiovanni. “The ducks look fab and the village looks so nice as you drive past with Honeywood open, the new pond railings and the knitted ducks and flags,” added Carshalton Mum Rebecca Wall. 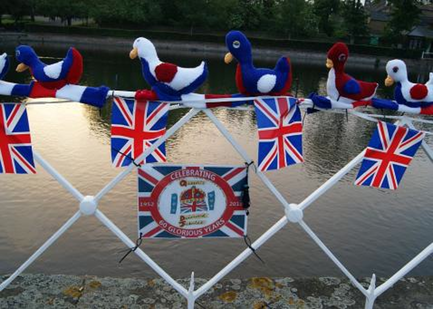 Two rows of mysterious jubilee-themed ducks appeared on the North Street bridge during the night of Thursday 31st May. Many Carshalton Mums believed the knitted ducks to be the work of the Hooky Knitters, a group of Carshalton Mums who meet regularly at The Sun pub, Carshalton, and knit. Yarnbombing, the art of knit graffiti celebrates its international day on June 9, suggesting the knitting guerillas had been at work. Knit graffiti originated in the US and has seen whole streets hit with woollen 'tags' worldwide.